If your young reader has trouble remembering the details of a book he just read, or if you just have a disinterested reader, try this activity to jog his memory and keep his interest! Next time your child begins a new book, start a "diary" of important details from the story, like that character's name and the setting, to put your child in the shoes of the character. It will help him become more interested in reading and help boost his memory skills! 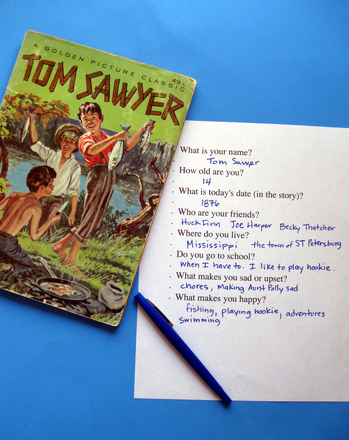 Use this fun twist on reading so the next time a book report is due he'll have (and remember!) all the information he needs to complete it! As your child reads the book, encourage him to remember details about a favorite character's life. What makes you sad or upset? Finally, discuss the significant event together. Ask your child if he would have reacted in the same way or differently, and why. Not only will this help him remember the story, but he'll gain insight into another person's life...even if that person is just a character in a book! Use this resource to teach your students how to use signal words as they explain the beginning, middle, and end of a fictional story.